Mohamed JEMNI is a Professor of Computer Science and Educational Technologies at the University of Tunis, Tunisia. He is the Head of the Research Laboratory of Technologies of Information and Communication & Electrical Engineering (LaTICE) at the University of Tunis (www.latice.rnu.tn). He has been the General chair of the Computing Center El Khawarizmi, the Internet services provider for the sector of higher education and scientific research in Tunisia from 2008 to 2013. 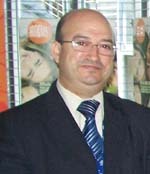 Since December 2013, he is the Director of ICT at ALECSO (www.alecso.org). Mohamed Jemni is also Adjunct Professor, Faculty of Science and Technology, Athabasca University, Canada (http://scis.athabascau.ca/scis/staff/adjunctList.php). He is a Senior member IEEE and member of the Executive board of IEEE Technical Committee on Learning Technology (www.ieeetclt.org), New Initiative Chair. Development of a Tunisian Grid environment for scientific research (www.tngrid.tn). Development of an e-learning environment for students with disabilities. He published more than 200 papers in international journals and conferences and produced many studies about ICT, E-accessibility, E-learning and Entrepreneurship Education for international organizations such as UNESCO, ITU and ALECSO. Prof. Jemni and his laboratory have received several awards, including the Silver medal of the International Fair of Inventions in Kuwait 2007, the UNESCO Prize 2008 for the e-learning curriculum they developed for visually impaired, President's Award for the integration of persons with disabilities 2009 and the "World Summit Award (WSA) - Mobile 2010" in the field of social inclusion. In April 2012, his laboratory LaTICE received the Google Student AWARD and he has received the Best Communication Paper of the Web For All 2012, and recently, Prof. Jemni received the International Telecommunication Union Award: “ICT Innovation application challenge” during the WSIS Forum in Geneva in May 2013. He is member of the steering committee of G3ICT – United Nations, Global initiative for Inclusive Information and Communication Technologies and he is also the president of a Tunisian NGO created in June 2011: the Tunisian Association of e-accessibility (www.e-access.tn). He has launched many initiatives to promote ICT accessibility in the Arab region including the project of WCAG2.0 translation to Arabic (http://www.utic.rnu.tn/wcag2.0) to promote accessibility of Arabic Web Content and the 2009 initiative for using ICT to develop Arab Sign language (www.icta.rnu.tn/asl/).